I had the honor and pleasure of dining at Blue Hill at Stone Barns a few weeks ago. It was wonderful! Bite after bite of seemingly simple food that erupted with flavor the moment it touched my tongue. Dan Barber and his chefs at Blue Hill are absolute geniuses. The restaurant is unique in that there is no menu at Blue Hill; instead its chefs create a series of tastings inspired by what was harvested that day. Since James and I visited mid-August, our multi-coarse meal was heavily based on fresh heirloom tomatoes, sweet corn, and juicy peaches. One of the many highlights of the night was a peach and tomato soup topped with a yogurt foam. This savory soup was somehow packed with intense fruit flavor while still remaining to be light and refreshing – a truly enchanting experience as the delicate flavors danced in my mouth. a smooth and creamy texture. This was especially important for my version of the soup because I was also trying to keep it low in calories -- unlike the restaurant version, which I am sure was thickened with some kind of an oil emulsion. Finally, although I don’t remember fresh corn playing a role in this particular coarse at Blue Hill, it played such an important role in so many of the dishes of the evening that I decided to swirl a corn basil puree into each individual serving. The result was delicious and reminded me of my dinner at Blue Hill just as I had hoped. This soup is best enjoyed at room temperature, and must be prepared at the height of the summer when all its ingredients are at their peak. Bring a large pot of salted water to a boil. Add the corn to the water and boil for 10 minutes. Remove the corn from the water and submerge in cold water for 10 minutes. Remove the corn from the water, pat dry with a kitchen towel. Using a knife carefully remove the kernels from the cob. Set aside. Spray a large skillet with olive oil. Sauté the peaches until they just begin to soften, just a few minutes. Remove from heat. In a blender combine ½ of the peaches, ½ of the tomatoes, ¾ of the yogurt, the vinegar, and 1 teaspoon salt. Puree until smooth. Pour the puree into a medium bowl and mix in the remaining peaches and tomatoes. Taste and add additional salt as if needed. Set aside. 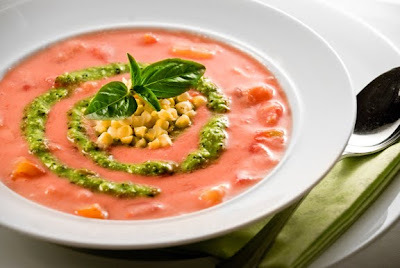 In a food processor puree ¾ of the corn, the basil, ½ teaspoon salt, and the remaining yogurt until smooth. If necessary add a few teaspoons of water to form a thick puree. To serve, ladle the tomato peach mixture into a bowl. Top with a swirl of the corn basil puree and a few kernels of corn. Must be the most beautiful soup I have looked at in a while!!! I love all the flavors you have used!!! Excellent! This looks so delicious and so refreshing. Kind of reminds me of the fresh tomatoes I had last week in Little Compton. Nothing like fresh toms! I like how you added your own twist to this recipe! Thank you so much Sue and Nina!